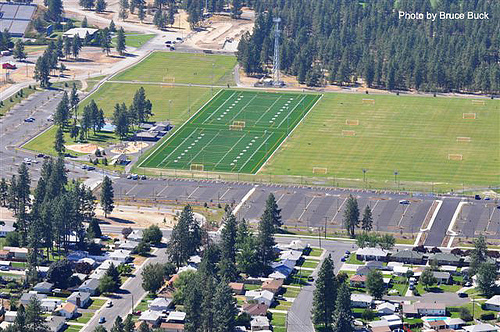 We have had several opportunities to play on these football fields at the Dwight Merkel Sports Complex. Let me just say that this incredible sports complex is a shining star of Spokane. It is such a wonderful mix of family, fun and utility. It is an amazing feat for the City of Spokane to have given it’s community this bastion of sports and family fun during the most difficult economy since the Great Depression. I Copied the FAQ from the Spokane Parks Website. You will find them below. Where is the Dwight Merkel Sports Complex? 5701 N. Assembly, adjacent to Joe Albi Stadium. and athletic opportunity for all children. What activities are available at the Merkel Complex? How much did the Merkel Complex cost and how was it funded? property that was approved by City voters in 1999 and subsequently held in reserve. How much does it cost to reserve the fields at Merkel? – Fees include ball field prep for first and fourth game of the day. – Practice fees are the same as game fees. of the fields, the user fees were developed and approved by the Park Board. How can I find more information about reserving the facility? Who does the scheduling for City run sports? Adriano Eva, who can be contacted at aeva@spokanecity.org or 509.625.6625. When can the BMX Track be used? limited to prevent over use until the dirt has further compacted. What information can you provide about the new trails? run and walk without navigating through parking lots, playing fields, etc. we will and we will try and have the watering done as early as possible.